We are keeping improving the quality of spell checking for our users. With release 4.9.2 our American English and Spanish dictionaries have been enlarged with more than 200,000 modern words and terms. 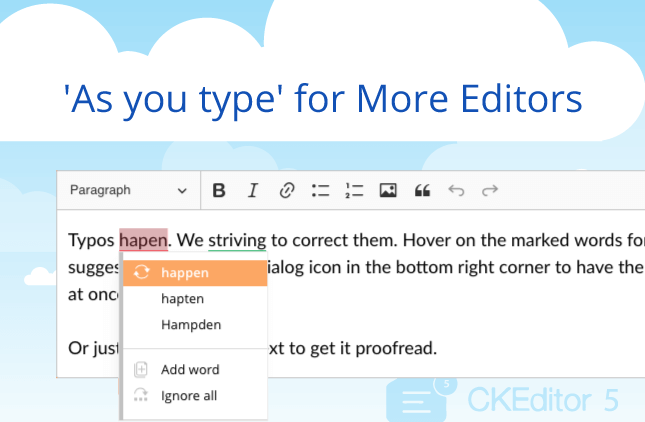 Anytime your users are typing, editing and proofreading their texts in English or Spanish, all the new words added will not be reported as incorrect or misspelled. Moreover, corrections for detected errors are more accurate and comprehensive. 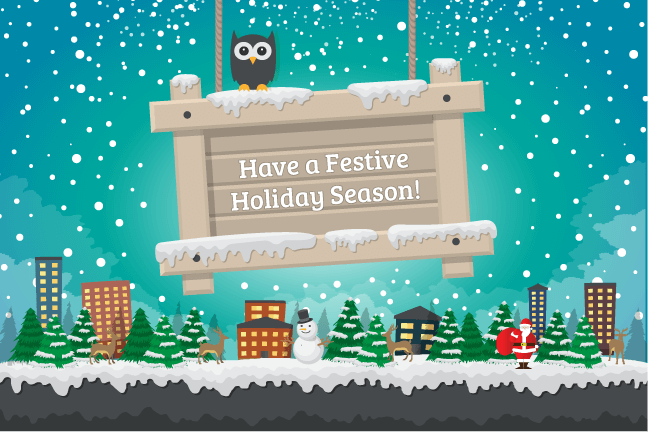 All our paid customers and their end-users may already benefit and enjoy the enhanced English and Spanish spell checking. Each year modern technologies and researchers in the medical field boost the number of new medical terms that come into use. Our team is keeping an eye on this evolving trend and trying to maintain the Medical word list up-to-date respectively. This time our English Medical Dictionary has been extended with more than 2,500 new medical terms. 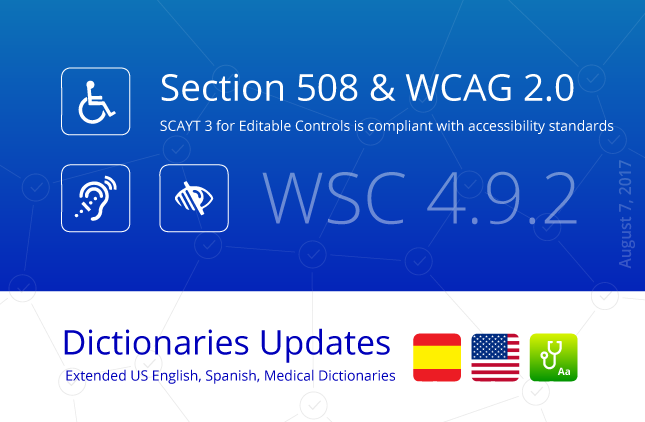 SCAYT 3 for Editable Controls is Section 508 and WCAG 2.0 Compliant! Now our new SCAYT product is available for even wider range of users. Compliance with Section 508 and Web Content Accessibility Guidelines (WCAG) 2.0 standards makes it possible for people with disabilities perceive, understand, navigate, interact and contribute to the Web, and often improve usability for users in general. There are four main principles that we kept in mind when implementing and verifying SCAYT compliance with worldwide Web Content Accessibility standards: perceivable, operable, understandable, and robust. 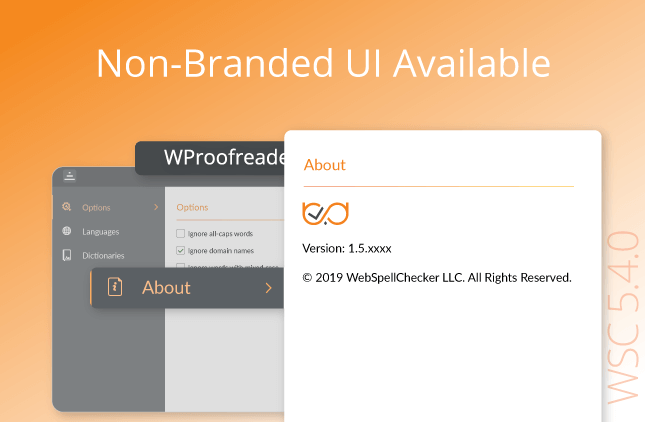 Reach us at support@webspellchecker.net and check how you can evaluate and upgrade to the latest version of the WebSpellChecker application 4.9.2.